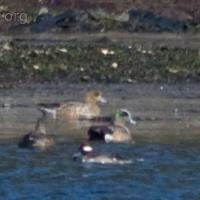 This was the first time I saw Eurasian Wigeons (Anas penelope). Observed at Port Krestof. 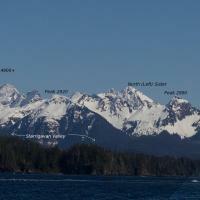 Baranof Mountains with labels as seen from near Port Krestof. This entry was posted in birds, photojournal and tagged american wigeon, Baranof Island, Eurasian Wigeon, Kruzof Island, Port Krestof. Bookmark the permalink.